A big part of why I haven't posted much recently is that I've been very busy. Most notably, I'm working as the campaign manager for Juliet Burgess, who is the Green Party of Canada candidate in the Calgary-Nose Hill riding. At 18, Juliet is the youngest candidate running for the party in this election, which has made for some interesting responses from people. Many have been very supportive, although ageism has made a few appearances. 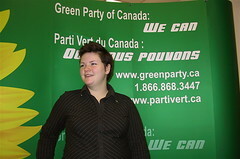 JulietBurgess, GreenParty, GreenPartyofCanada, GPC, Greens, CanadianElection, democracy, election.